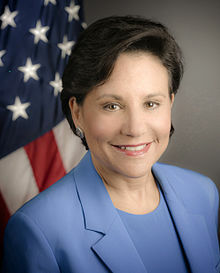 Penny Sue Pritzker (born May 2, 1959) is an American business executive, entrepreneur, civic leader, and philanthropist. She was the United States Secretary of Commerce from June 2013 to January 2017. She is the founder, chairman and CEO of PSP Capital Partners and Pritzker Realty Group. She's also co-founder and chairman of Artemis Real Estate Partners. She is a member of the Pritzker family. In 2012, Chicago magazine named her one of the 100 most powerful Chicagoans. In 2011 the Forbes 400 list of America's wealthiest showed her as the 263rd richest person in the U.S., estimated net worth of US $1.7 billion, and the world's 651st richest person. In 2009 Forbes named Pritzker as one of the 100 most powerful women in the world. Pritzker was nominated to be the next United States Secretary of Commerce by Barack Obama. ↑ Sweet, Lynn (2013-05-02) "Obama nominates Chicago exec Penny Pritzker as commerce secretary", Chicago Sun-Times. Retrieved 2013-05-02. This page was last changed on 31 August 2017, at 09:39.